Sometimes, even when we see ourselves as complex, delicate Pavlovas, we have to accept that there are days when we are simply pound cake. Not that I am knocking pound cake. I recently tried out Edna Lewis’s version and concluded that my life was now distinctly divided between the periods before I first tasted this cake, and after. But I do have a point here. Sometimes we do hard stuff, sometimes we take short cuts. Sometimes we enter the kitchen with bold intentions, and ingredients shortages, time or personal failure impede us. At those moments we do not give in, we pivot. So here is a fast save for the holidays, when you may have big ideas about a side dish that somehow come undone, or you are simply in search of an easy burst of American comfort for the table. I fully intended to make Sweet Potatoes Anna with Prunes on Rosh Hashanah, but was felled by my realization far too late that I was out of prunes, and could not find my mandolin. 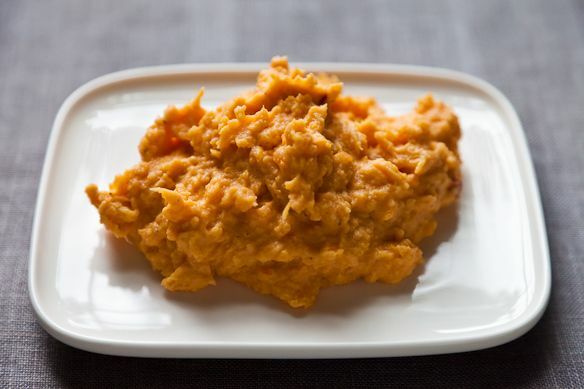 But, I deeply craved sweet potatoes on the table, and moved quickly to Orange Saffron Mashed Sweet Potatoes. I tripled this recipe so I would have enough for eight guests, four of them children. I loved that I could toss these guys in the oven and go about trying not to mess up my fish and desserts for an hour. When that wonderful smell of slightly smoldering sugar began to fill the kitchen (followed by the sizzle and burning smell of sweet potato dripping to the floor of my oven, which yes I just cleaned but am I complaining?) I grabbed them and let them cool until I could comfortably peel them. Can we pause here to appreciate the way sweet potato skins just sort of slide off like a silk nightgown, revealing the tantalizing orange flesh beneath? Okay, thank you. So now you are mashing this all up with the spices by hand, preferably with a masher but a big old wooden spoon will do just fine, too. Add some more olive oil. I can tell you want to. Stop sneaking bites. I left this on the stove for an hour or so until my guests arrived, then gave it a quick reheat. I cannot tell you this is the most exciting dish I have ever made, but it is familiar and delicious and a perfect side dish bailout, when your mind, or hands must be somewhere else. Roast the sweet potatoes on the oven rack for 45 minutes to an hour, until they're quite soft. Set aside until they're cool enough to handle. Like Jenny? Last week she rubbed elbows with Ribollita. Can these be done in a pan so they don't ooze onto the bottom of the oven? There's something to be said for simplicity, especially when the pressure is on. Thanks Jenny, and thanks Cara!